Dry eye syndrome is a very common condition with various different approaches for dry eye treatment. An estimated 14% of adults aged 40 and above have dry eyes. This means that in the United States, more than 20 million Americans are affected. Women are more prone to dryness, and are affected about 1.5 times more frequently than men. 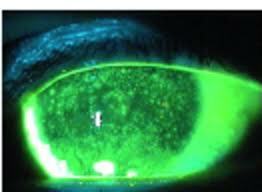 Severe dry eye, as indicated by the significant patchy yellow fluorescein staining throughout the front surface of the cornea. This appearance of corneal dryness is called superficial punctate keratitis, or SPK for short. To evaluate your dry eyes, your ophthalmologist will take note of your past medical history and medications, as well as perform a full ophthalmic examination on your eyes using the slit lamp. During the examination, your ophthalmologist will look for signs of any problems with your eyelids, lacrimal glands, meibomian glands, conjunctiva and cornea, all of which can result in dry eye syndrome. It is precisely because there are so many possible causes that multiple dry eye treatment approaches are required. Unfortunately, there is no available cure at present. Dry eye treatment is therefore currently aimed at relieving the symptoms of dryness and reducing any potential risk of damage to the cornea. There are many simple and common sense things that you can do yourself to reduce the effect and symptoms of dry eyes. Environmental: Humidifiers increase the humidity and moisture in the air. This in turn reduces the evaporation of tears from your eyes, and so your eyes will feel less dry and more comfortable. Tear evaporation can also be lessened by lowering the speed of fans and air-conditioners or by wearing moisture chambers. Air filters may help by decreasing the amount of dust in the environment, thereby reducing further irritation to eyes that are already dry. Cigarette smoke worsens dry eye symptoms, so quit smoking if you can, and stay away from people who do. Eye care: Long-term contact lens wear is known to cause dryness, so if you are a contact lens wearer, reduce the number of hours you wear them. Minimizing the amount of mascara and eye makeup that you use will also improve the comfort of your dry eyes. Often when you are concentrating, such as when reading or working on the computer, you will forget to blink and rest your eyes. So try to take frequent "eye breaks" by blinking and shutting your eyes for around 5 to 10 seconds every 15 minutes. This will help to moisten your eyes and keep them comfortable. Daily lid hygiene (cleaning of your eyelids with diluted baby shampoo) is beneficial if you have dandruff and inflammation of your eyelids. By scrubbing the edge of your eyelids with a cotton bud dipped in diluted baby shampoo, you remove debris and bacteria from the base of your eyelashes as well as massage the oil out of the meibomian glands. This improves the quality and stability of the oil layer of your tear film. Artificial tears and lubricating eye drops are the most well-known by the public, and hence the most commonly used dry eye treatment medication. There are, however, other available medications that may be appropriate depending on the cause and severity of the dry eyes. Artificial tears: There are many artificial tear products that are available over the counter for dry eye treatment, including Theratears, Systane and Optive. It is usually worthwhile trying the different ones for at least one month until you find one that soothes your eyes better than the others. In general, you can use preserved artificial tears (i.e. eye drops with preservatives) up to 4 times a day. However, if you find that you need to use the eye drops more than that, then it is better to use artificial tears that do not have preservatives. This is because the preservatives contain chemicals that can irritate the eyes if used too often. Non-preserved artificial tears come in single-use vials. Each time a vial is opened and used, it must be discarded even if not used completely. You can use non-preserved artificial tears as many times as you like throughout the day. Lubricant gels and ointments: Artificial tears are very useful for symptom relief in mild dry eyes. However, they may not last long enough to provide relief for the more severe cases. Lubricant gels, such as Viscotears and Celluvisc are thicker and will provide longer relief, but can blur your vision slightly (which eye drops generally don't). Ointments, such as Lacrilube will last the longest, but are thick and will definitely blur your vision for as long as it remains in your eye. Ointments are usually applied at night before bedtime. Artificial tear inserts: These are tiny (size of a grain of rice) inserts that are inserted between your lower eyelid and your eyeball once or twice a day. The insert dissolves slowly and releases hydroxypropyl cellulose which thickens and stabilizes your tear film, thereby providing lubrication to your eye. Placing the inserts correctly may be tricky and usually requires the use of a special applicator (picture to the right). An example of such an insert is Lacrisert. Anti-inflammatory eye drops: Inflammation of the ocular surface can affect the glands that are important in tear production, thereby reducing the ability to maintain a healthy tear film. This inflammation can be controlled by various eye medications, including immune suppresants such as Cyclosporine A 0.5% (Restasis), corticosteroids such as Prednisolone 0.5% (Predsol) and Dexamethasone 0.4% (Maxidex), and non-steroidal anti-inflammatories such as Ketorolac (Acular) and Diclofenac (Voltaren). Antibiotics: Oral antibiotics such as Doxycycline and Minocycline are particularly helpful as dry eye treatment if your dry eyes are related to meibomian gland dysfunction, blepharitis or rosacea. They work by reducing the amount of bacteria on your eyelids (the bacteria breaks down the lipid layer of your tear film) and by inhibiting the production of free fatty acid from the meibomian glands (free fatty acid is a degradation product that destablizes the tear film and promotes inflammation). These antibiotics are typically taken as a 3-month course. Note that they may cause stomach upsets, make your skin more sensitive to sunlight, and interfere with your other medications. You should not use these antibiotics if you are pregnant or are breastfeeding. Omega-3 fatty acids: Some research has shown that taking omega-3 fatty acids can help to relieve symptoms of dry eyes by reducing inflammation in the eye. Omega-3 fatty acids are available either as supplements or naturally in foods such as fish, walnuts, flaxseed oil and canola oil. It is not yet known what amounts of omega-3 fatty acid provide the best results for dry eye symptom relief. Bandage contact lenses: These are special contact lenses that help to retain moisture and protect the surface of your eye. They are useful for severe dryness and dry eye due to exposure, but are not suitable for everyone. Punctal occlusion: Your tears are drained from the eye to the nose via the tear ducts. The punctum is the opening of the tear duct at the edge of your eyelid. You have one punctum each in the upper and lower lids respectively. Occluding the puncta stops tears from draining away so tears stay longer in your eyes. Usually, occlusion is achieved with small silicone plugs that fit snugly at or just inside the punctum. Punctal plugs generally do not cause problems if inserted properly and can be easily removed. In severe dry eye, it may be preferable to permanently seal off the puncta with thermal cautery or laser. 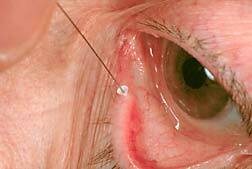 Eyelid surgery: The eyelids spread the tear film across the surface of the eye during blinking. Any problem with the eyelid that interferes with blinking or closing the eyes can cause dryness. Possible eyelid procedures include lateral tarsorraphy (picture to the right) to close the outer third of the eyelid and botox injections to cause the upper eyelid to droop down. Dry eye syndrome can be a difficult condition to deal with. Dry eye treatments are not one-size-fits-all. It is important to tailor treatment to the cause and severity of your dry eye. Any underlying cause for the dry eye, such as medications, should be addressed. It is a good idea for your ophthalmologist to monitor your eyes regularly so that problems arising from the dry ocular surface can be picked up and dealt with in a timely manner.